How drones could be utilized in the landscaping industry? Do you remember calling your friend’s house and asking the person who answered the phone if they were there? Now people rarely make phone calls in lieu of text messaging. Do you remember sending a fax, receiving a page or even reading a physical book? Technology changes just about everything, and landscaping is no different. 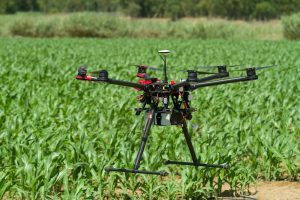 Although Groby Landscapes has no plans in the near future to use drones, we look at how drones could be used the landscaping industry and whether in years to come they could be utilized. A drone can be sent to any piece of land to take measurements in real time. This eliminates the need for a crew of employees to go out and take measurements for a bid. The process is much quicker than a crew visit and it saves money in all sorts of ways, including gas, payroll and employee travel time. And the savings cut both ways, saving both the landscaper and the customer. One of the biggest challenges a landscaper faces is water. An expert landscaper can survey the land in order to understand how water flows on the property. After all, the flow of water can either help or drown plants. And improperly landscaped properties can increase the chances of flooding. Getting the lay of the land is a difficult task on ground level. An aerial view of the property gives a landscaper a much better feel of the irrigation. And a prevented flood is much cheaper than a real flood for everyone involved. Landscaping can bruise. It’s a tough business. Employees must handle heavy equipment and often times must put themselves in compromising situations. High-level landscapers send employees up to rooftops and tree canopies, for instance. A drone removes the danger. No longer does an employee need to get up into high places for a good view. This eliminates any liability on the employers part which reduces insurance costs. And those savings are often times passed along to you. Today’s drones can be flown from a remote location with the drone hovering in any spot, locked in by GPS. The landscaper then uses the images gathered to render design illustrations. A computer assists with the illustrations, making the design plans as precise as possible. This allows the vision of the landscape designer to come to fruition quicker, saving you money.